That's a very odd tweet. The link leads to a completely unrelated article, whilst there's a link to another tweet that's also been deleted apparently. Not sure what's up there. you make it a POINT that there are no microtransactions “. And then you taint ALL of it for a quick buck. Never been so disappointed in your company and feel honestly like I’ve been taken for a ride. Worth pointing out, the trailer specifically lists Steam as a platform. Things could change, of course, but given the tweet offers nothing to back up the claim and links to the wrong article, I'm inclined to believe this hasn't changed. The trailer wouldn't be lying! It'll come to Steam, eventually. If this ends up being true, Obsidian can literally go **** themselves. If this ends up being true, it will almost certainly be entirely a Private Division decision. Yep,if this happens, I'm definitely out. I realize saying so doesn't matter much, since Obs spurns these forums, but still worth saying to the audience. Enjoy the higher percentage on lower sales. I'm honestly surprised the MS overlords would allow this. Its another weird relationship with a third party that doesn't benefit them. I hope they don't do this. TOW's publisher is (a subsidiary of) Take-Two, not Obsidian. Put the pitchforks and torches away. And by the way, PoliticallyCorrectGamesN is trash, and you shouldn't give them the clicks. I will cross my fingers it'll be Epic exclusive. Oh damn. Looks like I won't be playing this game then. I'm not really familiar with them, what's wrong with them? The 'witty' pseudonym you've given them makes me think I'll probably find the reasons given laughable, but I'm open to being persuaded otherwise. 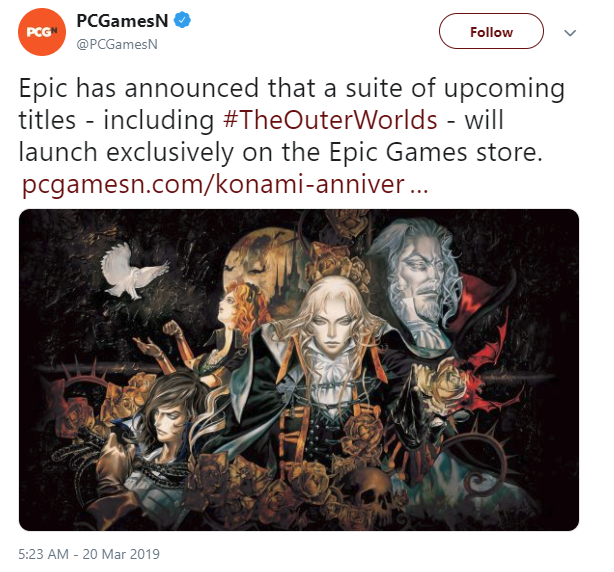 They have misspelled The Outer Wilds, game with similar title, but not the same. https://store.steampowered.com/curator/33102093/ - Picky Gamer Girl! *IF* this story is true, there is no way in hell I buy this game. And I've probably owned every Obsidian game made up to this point. The Epic game launcher is literally spyware that data mines your PC, the first autocomplete suggestion if you google "epic launcher" is "spyware" lmao. Beyond the fact that their editorial line is based on fellating publishers, Google and the other usual suspects, it's less of a news outlet than a place for their writers to throw their poorly sourced opinion pieces in. A few months ago there was this non-stop ranting about how crypto miners were destroying gaming for everyone, for example, disguised as hardware "news" articles. It's also full of garbage clickbait "what do we know about X? Release date of X" articles that contain **** all about X, and amount to "we don't know jack squat about X". And they keep pushing those back to the front page every time there's the smallest bit of info about X released. The website layout is atrocious for widescreen, but if you're not browsing from a phone, you're SOL. The frequent virtue signaling is just the icing on the cake. It reminds of when Steam was new back in 2003/04. The ****storm that was kicked up over it was epic among nerds. Heh. LOL, it most obviously is. But sure, let shadow of doubt besiege us. Get a load of this "alpha" male. Just because you're incapable of being a decent person, it doesn't mean that others are "faking" it. I love how people use the words "alpha male" as if it were something bad.